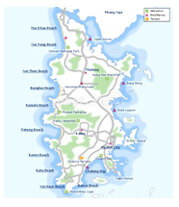 About Phuket | We provide dental clinic Phuket, Patong Beach. Patong Dental Clinic At Sea Smile Dental Clinic. The name Phuket, (or as well-known as the Andaman Pearl), is derived from the Malay word bukit, meaning hill. The island was previously named Junk Ceylon on European charts, a corruption of the Malay Tanjung Salang meaning Cape Salang. Later it became known as Thalang, after the name of the main town on the island. The island did not come to be known as Phuket until quite late in its history when the administrative center was moved to a mining town in the center of the island called Phuket. Phuket lies off the west coast of Southern Thailand in the Andaman Sea, approximately 890km from Bangkok. It is Thailand's largest island at 550sq km, roughly the same size as Singapore, and is surrounded by many smaller islands that add a further 70 sq. km to its total land area. Phuket is separated from the mainland by the Chong Pak Phra channel at its northernmost point, where a causeway connects the island to the mainland. The most beautiful beaches such as Patong beach or Karon breach are found on the West coast, separated by rocky coves and headlands. The east coast comprises limestone shoals with only a few sandy beaches while spectacular limestone islands adorn the horizon. Coral gardens full of exotic marine life dot the emerald waters surrounding the island. Phuket has the second highest per capita income of any province in Thailand outside of Bangkok. Tourism has dominated the island's economy for the past three decades. Each year, over 3 million visitors arrive to enjoy Phuket's natural splendor and many amenities. For much of its history, Phuket's economy was based on tin mining. Since the fall in the demand for tin in the 1980s and restrictions placed upon tin dredging to protect the coastal waters, the industry's importance has greatly declined. Rubber became an important part of the local economy at the beginning of the twentieth century when large areas of rainforest were cut down to make way for rubber plantations, many of which can still be seen on the island. Other contributors to the local economy include: Pearl farms; Agriculture and horticulture in the form of coconuts, cashews, tapioca, cacao, rice and pineapple; prawn farming, and the processing of marine products and for this time Phuket, Thailand is fast-becoming the world’s most favorite medical and dental tourism destination among millions of patients who are looking for high-quality at affordable prices.